(CNN) -- As top government and business leaders wrapped up a weekend forum on the Middle East, all eyes were moving toward Washington to restart the stalled Arab-Israeli peace process that many say lies at the heart of political and economic instability in the region. 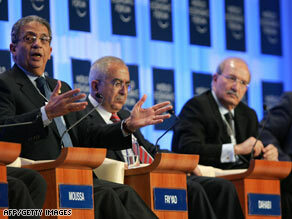 Arab League Secretary-General Amre Moussa, left, gestures at the World Economic Forum. U.S. President Barack Obama was scheduled to meet Monday with Israeli Prime Minister Benjamin Netanyahu at the White House, the first of a series of meetings scheduled with Middle East leaders ahead of his planned trip to Egypt next month. With the U.S. fighting two wars and the spiraling global credit crisis, Middle East government and business leaders are concerned that momentum for a lasting peace agreement in the region under Obama's policy of rapprochement with regional powers such as Iran may stall. "We are not ready for an open-ended process," Amr Moussa, secretary-general of the League of Arab States, told the audience at The World Economic Forum in Jordan, which ended Sunday. "That's why I have emphasized the point that this year has to witness progress." "The situation in this region is unstable and dangerous and [President Obama] should properly address the Arab-Israeli conflict and, in particular, the Palestinian issue.," Moussa said. "There must be a viable Palestinian state and a comprehensive peace that should involve Syria and Lebanon." The forum on the banks of the Dead Sea drew more than 1,400 leaders from 85 countries to discuss the credit crisis, economic development and educational issues facing the region. Throughout the event, leaders of Middle East nations echoed the call of King Abdullah II of Jordan for a "57-state solution" to the Israeli-Palestinian problem in his Friday keynote address. "The Arab peace initiative has offered Israel a place in the neighborhood and more - acceptance by 57 nations, the one third of the UN members that do not recognize Israel," King Abdullah said. "Inaction is not an option." The Arab Peace Initiative, first proposed in 2002, offers recognition to Israel in return for withdrawal from lands occupied since the 1967 Arab-Israeli war. Speaking at the conference, Israeli President Shimon Peres called King Abdullah's proposal "a very encouraging and timely proposition. Time has come to depose war, hatred and terror and come to real business -- how to assure the life, the safety and the future of our children. "There's a change in the world, there's a change in the United States, and many of us are sick and tired with the situation," said Peres, a former prime minister and 1994 winner of the Nobel Peace Prize for his role in Palestinian peace negotiations. As president, Peres has a largely ceremonial role in Israeli government. "The present government of Israel has announced that they're going to abide by past commitments of the past government, and the previous government adopted the Roadmap which has clear references to a two-state solution," he said. The conference focused on a regional response to the credit crisis, diversifying business and industry away from the energy sector, and stopping the brain drain to the West through better education and research in the region. Whereas most of the developed world grapples with issues of dwindling population and replacement work force, more than half of the Arab world's population under the age of 25, forum organizers said. "Compared to the European birth rate of 1 percent, that's extraordinary," said Kevin Kelly, co-chairman of the forum and chief executive officer of Heidrick & Struggles, a U.S.-based search firm. "They have a fascinating opportunity to grow and learn from mistakes made outside the Middle East."